Cytotam (Tamoxifen Citrate) is widely used to treat breast cancer and may be used after the patient has undergone surgery or radiation therapy. Other indications include being used for breast cancer prevention in women who are considered to be at risk and treating infertility occurring as a result of ovulation problems. 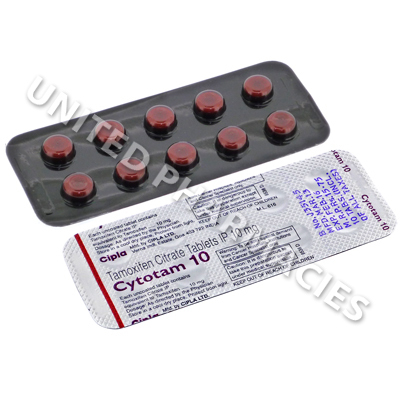 Cytotam (Tamoxifen Citrate) is widely used to treat breast cancer and may be used after the patient has undergone surgery or radiation therapy. Other indications include being used for breast cancer prevention in women who are considered to be at risk and treating infertility occurring as a result of ovulation problems. The active ingredient is a type of anti-oestrogen which is known as a SERM (selective oestrogen receptor modulator). It functions in a similar way to oestrogen in the uterus, liver and bones. However, its action does not mimic oestrogen in other body parts, including the breasts. The majority of breast cancers will grow faster if oestrogen is present. These types of cancer are known as oestrogen receptor positive cancers. By blocking the oestrogen receptors on the cancer cells, the cancer is unable to spread and reproduce. This can help to stop it from spreading to other parts of the body. In some cases, this medicine may be used for DCIS (ductal carcinoma in situ). Researchers have studied its effects if used for other conditions, such as gynecomastia. 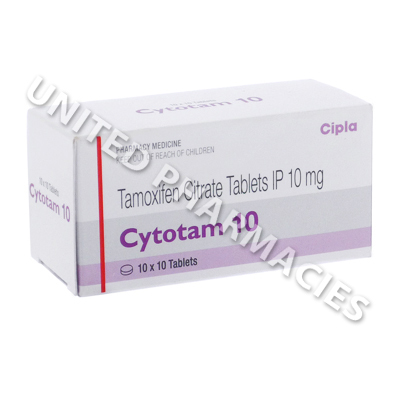 Cytotam (Tamoxifen Citrate) tablets contain 10mg of the active component. In all cases, the dosage will need to be individualised by your doctor. The dosage will depend on the condition being treated and the patient's medical situation. It is possible that women or men treating metastatic breast cancer will be told to take a dosage ranging from 20mg to 40mg every day. Doctors generally tell patients to take it as two divided doses, in the morning and evening. However, the required amount of medicine to be taken could differ for each patient, and you must only take the amount of medicine that your doctor instructs you to take. The dosage for ovulation induction, palliative breast cancer, adjuvant breast cancer or other conditions will also need to be carefully determined by a doctor. Report any side effects that you notice to your doctor. Some side effects are serious and the patient will be required to consult their doctor immediately should this occur. Examples include unusual vaginal bleeding, menstrual period irregularities, a new lump occurring on the breast, eye pain, fever and other reactions that have not been listed here. There may be a risk of uterine cancer, blood clots affecting the lungs or strokes. Certain factors may put patients more at risk of this. Therefore you are advised to discuss all of the risks of treatment with your doctor before taking this medicine. Your doctor may tell both males and females who are taking this medicine to use two different non-hormonal contraceptive methods for the entire duration of treatment and for a period of time after treatment has finished. Always use Cytotam (Tamoxifen Citrate) as you have been prescribed by your doctor. Never self-medicate or change your dosage without first consulting your doctor. The correct dosage can vary depending on your health, medical history, and the severity of the condition being treated.